The first look at the history behind Stephenie Meyer's bestselling Twilight series, timed to release with the third movie, EclipseThe characters of the Twilight Saga carry a rich history that shapes their identities and actions over the course of the series. Edward, for instance, may look like a seventeen-year-old teen heartthrob, but was actually born in 1901 and died dur The first look at the history behind Stephenie Meyer's bestselling Twilight series, timed to release with the third movie, EclipseThe characters of the Twilight Saga carry a rich history that shapes their identities and actions over the course of the series. Edward, for instance, may look like a seventeen-year-old teen heartthrob, but was actually born in 1901 and died during the Spanish Influenza of 1918. His adopted sister, Alice, was imprisoned in an insane asylum in 1920 and treated so badly there that even becoming a vampire was a welcome escape. 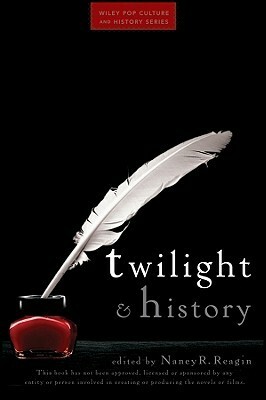 This book is the first to explore the history behind the Twilight Saga's characters and their stories. You’ll learn about what life might have been like for Jasper Whitlock Hale, the Confederate vampire who fought during the Civil War, Carlisle Cullen, the Puritan witch hunter-turned-vampire who participated in the witchcraft persecutions in Early Modern England, and the history of the Quileute culture that shaped Jacob and his people —and much more. Gives you the historical backdrop for Twilight Saga characters and events Adds a whole new dimension to the Twilight novels and movies Offers fresh insights on vampires, romance, and history Twilight and History is an essential companion for every Twilight fan, whether you've just gotten into the series or have followed it since the beginning.